After almost two years of construction, TV5 will finally broadcast on its new Media Center in Reliance, Mandaluyong beginning Monday. 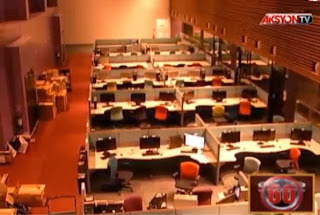 Kapatid viewers will be greeted with a new state-of-the-art studio, a much bigger newsroom and fancy workstation for its employees, similar to CNN, as one tipster told us. Based on the photos taken by TV5 newsers, the new Media Center looks more contemporary and modernized as compared to the antiquated studio in Novaliches — their home for more than 20 years. Reporter Jeff Caparas was able to tour their newest digs Saturday afternoon for a live broadcast on Balitang 60. As what he noted in his report, one of the advantages of their new Mandaluyong studio is that it's more accessible for the Kapatid viewers — who may want to watch their tapings live. Time will tell if the new TV5 studio will become one of the top attractions in the Tiger City. As for the graphics, we heard that TV5 will roll out new packages for its official relaunch in January. Groundbreaking of TV5's Media Center happening today!